You gotta love a confectioner who’s tag line on their bags of candy is “Proper Sweets”. That really should say it all, shouldn’t it? 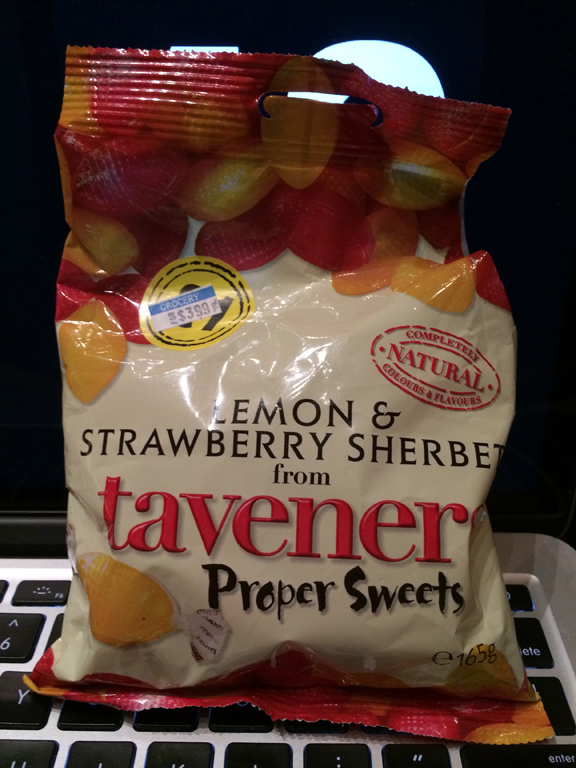 I’ve had lots of Taveners candies over the years, and generally speaking, like what they have to offer. Recently, I loved their Blackcurrant & Licorice hard candies, which knocked everything out of the park. 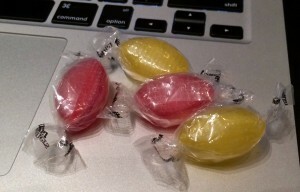 So then I bought their Rhubarb & Custard hard candies. And they were weak. Pfffft. So how will their take on perhaps THE most classic iconic British boiled sweet fare? Computer themed photos today, for some reason. If you’re not familiar with a “sherbet”, in British candy terms, it’s a hard candy filled with fizzy powder. Very similar in theory to Zotz. However, they’re not exactly like those-more on that later. Traditionally, it’s all about lemon sherbets. I’ve had many varieties, but had never even heard of a raspberry sherbet, so….yeah, I bought the bag. Like darling little footballs, they have a bit of texture on them. For me though, that was where the fun stopped. There’s absolutely no bite at all to their take on lemon. And I get it, not everything can be Super Lemon or a Warhead, but damn it, I can’t handle mild lemon with no tartness anymore. It’s just too boring. So I moved to the raspberry. Same deal. Nice raspberry flavor, no doubt-and I should point out that these candies are 100% natural, which I appreciate and actually have been seeing a lot more of from Europe these days. Good on ya, lads. I really do like that, but citric acid is natural as well: add some. Moving on to the “reveal” part of the candy eating experience, the fizzy center: that too, was underwhelming. Very inconsistent amounts of powder from piece to piece, as well as inconsistent as to whether it took a while to get to it, or if the the powder trickled out right from the beginning. But you know what? I can completely forgive those inconsistenices. To me, that reeks of not being super mass produced, which I like. So no problem on that. But damn it….I wanted a bigger impact from the fizz. It was ayeet, but I always have to go back to their superior Italian counterpart, Zotz. Zotz nail you in the face with hard candy flavor, and then floor you with their intense fizzy powder center. These Taveners Sherbets are like Gramma’s version, and even toned down at that, for safety. And the bottom line is that I don’t hate these: they’re enjoyable to eat, for sure. I just expected so much more. A pretty major dissapointment. However, I do recognize that these sherbets aren’t supposed to be as intense as Zotz: I get that there’s a long standing history here. But that doesn’t mean that I have to like these.